Apple’s App Store fees are coming under increasing pressure from Spotify, Netflix, and regulators. Cutting them could lower its earnings by 10% next year. End of day looking at Term Structure… nothing of consequence as we go into expiration in the morning. Great video Tony. 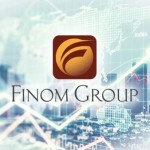 Welcome to finomgroup.com and we hope to see more of your videos to share with our visitors and subscribers. I plan to add this to our Half-Time video segment if that is ok with you. More people will be able to see it there as well. Thank you for the welcome Seth. Yes, please feel free to share it. 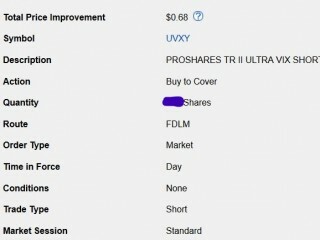 That’s from an article on Valuwalk.com dated back to January 19th 2018, just before the massive volatility event and market correction of February. great information. In today’s article you see some other measures that can be used to understand market levels of capital at risk/leveraged as well. @upspeed Yes, the consumer doesn’t seem to be a problem. Amazing how much fear is being pushed into the market and disbelief for the future economic expansion in 2019. But, I guess that comes with the territory and unorthodox measures taken after so many years of recovery. Seth, how and where do you see liquidity levels currently at in the markets? they are actually high because hedge funds have already largely unleveraged. That’s certainly reassuring. Do you have a source from where you look at these levels? mostly market commentary and the VIX itself as it hasn’t exploded which would indicate hedge funds need to hedge. If they had traditional leverage/exposure, they would very much need to be hedging. Regarding leverage, I have a chart that I would like to share here. How can I attach it to my message? on your profile you click on activity where you can create a post like this one here. Just below the box where you type you’ll see a little icon off to the left side. 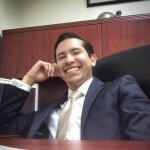 Click on it and you can upload your photo to your original post. Posted a comment with a chart attached if you can take a look at it and give your insight. Thanks! I did. In this mornings article you can also see how one can gauge leverage through margin debt levels and net non-commercial hedge fund positioning. Great! I just read the daily article and it was exactly what I was looking for! Thank you Seth. Friday Oct 26th, when you come across an A+ setup, try to go in strong. 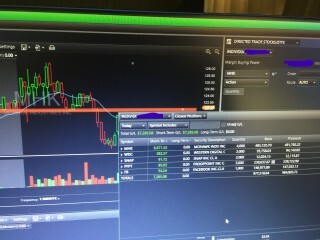 Here is a screenshot of my other non-vol trades. Been busy so I have not posted lately. Have a great weekend! 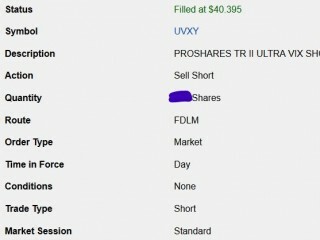 Thurs Oct 4th: Nice volatile day for scalping and adding to core: sold short UVXY at $40.39 and covered at $39.86. Not bad, 53 cent profit… Please see the attached. All the best…. I am with TD Ameritrade. 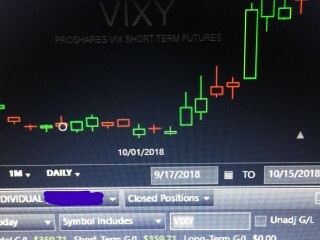 They only allow me to short VXX. 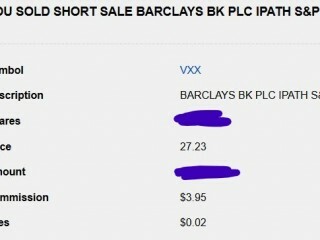 With IB you may get your short shares called in prematurely. From what I hear, E-Trade is pretty good. 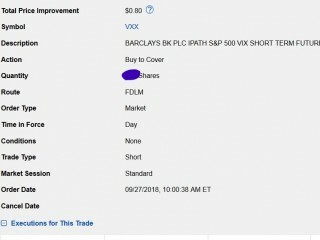 They DO have periods where they don’t allow the shorting of leveraged volatility products, usually during vol storms, but they are not known for calling in shares early either. Last night 09/26/18 was earnings reporting and it was disappointing, coming in at .36 instead of 50 cents. The company claims that this was within its model, albeit at the low end. The stock is getting crushed today, down over 23% deep into the $14s. Nice Job James, I actually added one more layer at $27.37 in AH as well. 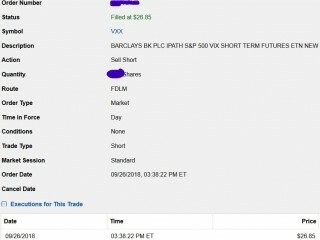 As per FinomGrp Premium Tweet on 9/26 at 14:48, I followed with a VXX short sell at $26.85. I have a screenshot for your perusal. All the best…. Tuesday September 4th: Greetings to all. 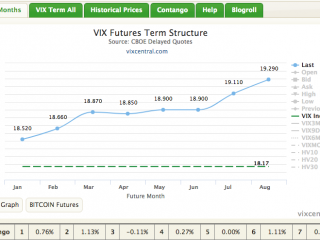 In alignment with the recent volatility, tvix has been a good trading vehicle. I, um, “got lucky” with top ticking tvix today. (approx 9:50am) Covered lower  Nice profit. Please see my attached orders. Have a good day.